Would You Nap In Public? What If You Had One Of These? Photo: Courtesy Of Studio Banana Things. Whether in class or on the subway, nobody likes getting caught doing the nodding-off-head-bob dance. And, while it makes sense why you might feel embarrassed if someone eyes you falling into a light slumber in the midst of, say, a wedding ceremony, napping in public (under the right circumstance) doesn't always need to cause humiliation. 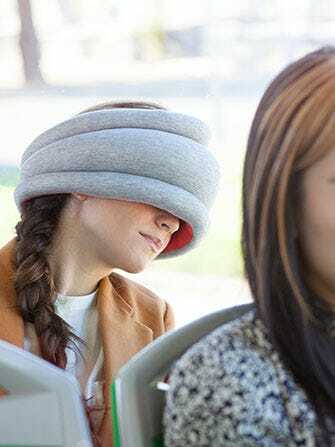 Enter the new Ostrich Pillow Light, the sleeker, smaller, less noticeable version of the Ostrich Pillow. Seeking to help you find more time to get some much-needed shut-eye, the pillow adjusts to the size of your head, mutes all sound around you, and is incredibly soft. Heading home for Thanksgiving and have a long journey ahead you? Well, you might want to consider one of these. Did we mention it also doubles as a scarf for chillier days? That it does.